Hosting the Summer or Winter Games is one of the most prestigious honors and responsibilities a nation and city can take on. With more than 10,000 athletes and 500,000 foreign travelers estimated to attend the 2020 games in Tokyo, officials in the world’s most populous city are currently doing all they can to build out sufficient stadiums, venues, hotels, infrastructure, and transportation in time for the event. Famed for incredible feats of technology and civil engineering, Tokyo may just be the most qualified city in the world to accommodate such a huge influx of foreigners. 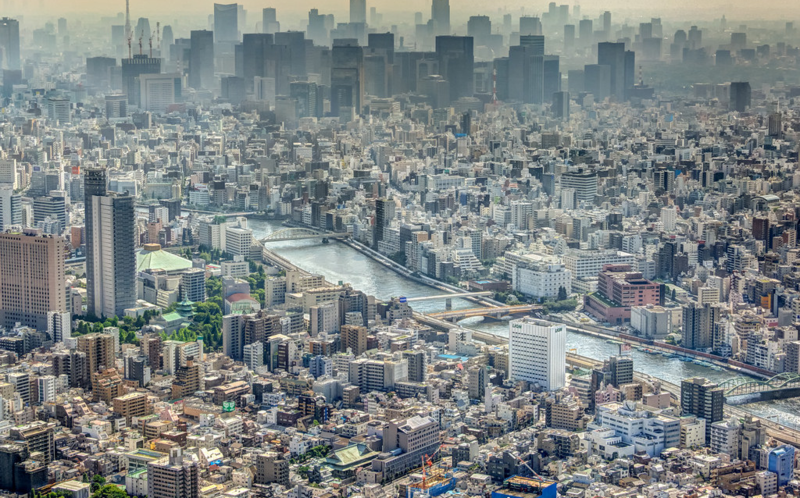 After all, Tokyo’s metropolitan area is home to more than 37.8 million people and is visited by nearly 5 million tourists annually – this is a city that knows a thing or two about crowd control. In a city of 38 million residents, what’s a measly 500,000 foreign visitors? Source. Unsurprisingly, investing billions of dollars into a completely new stadium that can comfortably seat 80,000 spectators is not without its complications. The changed plans of the Japanese Summer Games council for the event’s architectural center piece, the Japan National Stadium, are a testament to this. In 2012, while still bidding to host the Summer Games, Tokyo officials selected UK Architect Zaha Hadid to build the Japan National Stadium, a futuristic and sprawling complex originally budgeted at around one billion USD. But by the summer of 2015, projected costs had risen to two billion dollars and, among mounting dissent from the Japanese public who found the building to be gawdy, too expensive, and bicycle helmet-like, Japanese Prime Minister Shinzo Abe scrapped the plan altogether. A simulation of Zaha Hadid’s proposal for the Japan National Stadium. After rising costs and public ridicule referring to the building as a “bike helmet,” the plan was scrapped. Source. 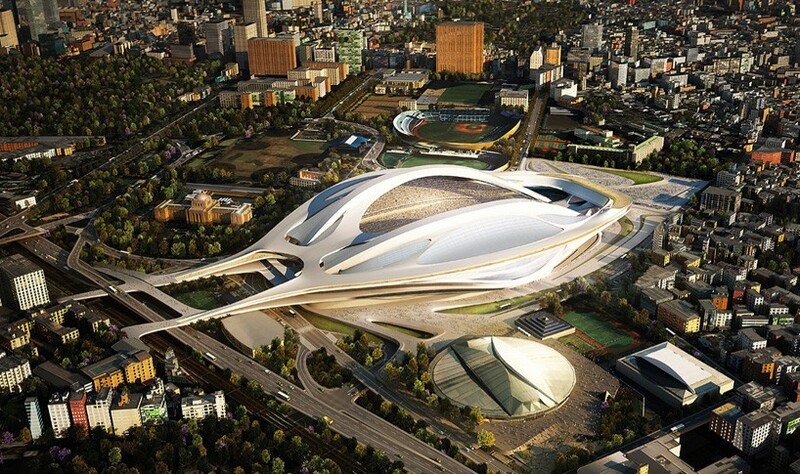 Shortly after halting development, Japan relaunched their competition to find a new architect for the Japan National Stadium. In December 2015, Japanese architect Kengo Kuma was announced as the winner. Kuma’s design was lauded for its use of natural materials like wood and its echos of ancient Japanese temples. A year later, the ground was officially broke in the Shinjuku district of Tokyo as construction on the new stadium began. The new proposal for the Japan National Stadium features lattice from larch (a Japanese timber), steel canopies, and plants and trees circulating each layer of the building so as to blend in with the surrounding park area. Once completed, the Japan National Stadium will host the main events of the 2020 Summer Games including the opening and closing ceremonies. Big Sight, Tokyo’s largest convention center, will host all press, media, and broadcasting activities during the 2020 Summer Games. Source. 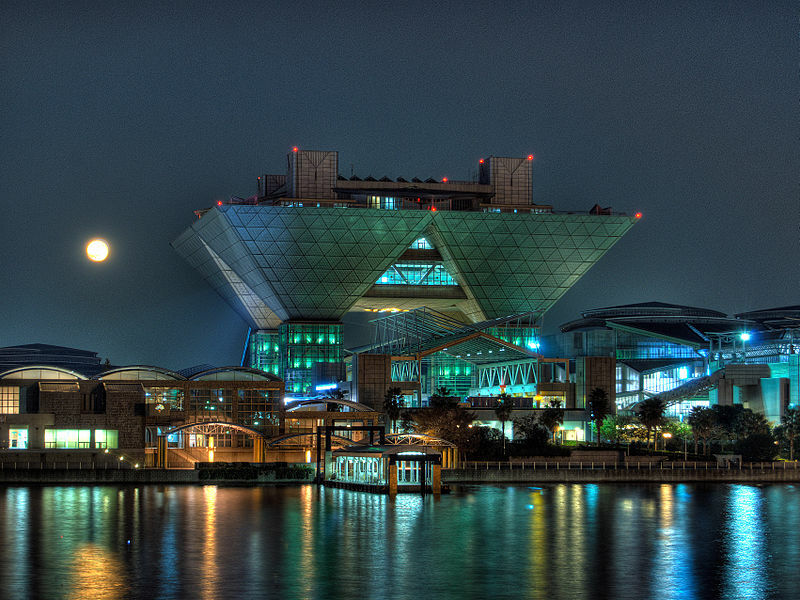 Located on Tokyo Bay, the striking Big Sight convention center will be the 2020 Summer Games venue for all press, media, and broadcasting activities. Construction was completed in 1996, making this water-front facing building one of the most unique features of the Tokyo skyline. The Tokyo Athletes’ village needs to be able to host about 17,000 athletes and family members. Source. Construction for the Tokyo Athletes’ Village began in 2015 in the district of Harumi. The project includes 21 residential buildings, each with 14 to 18 stories. This 134,000 sqm site will be the home of the athletes and their families during the games, who will get to enjoy these brand-spanking-new facilities for the month. Given the notoriously competitive real estate market in Tokyo, residents welcome what will be the addition of more than 5,600 apartments to their city once the athletes move out. The two main zones for 2020 Summer Games venues. Source. 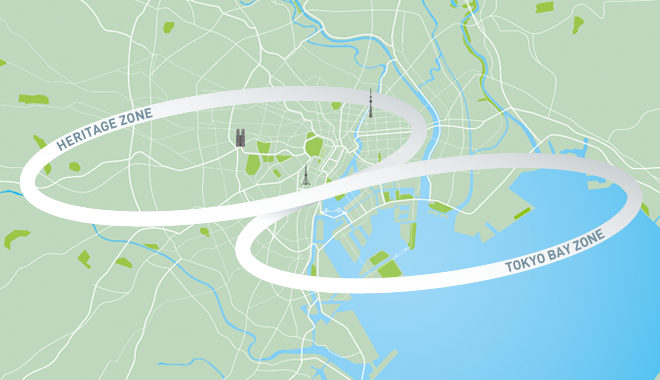 The events of the Summer Games will be held in 33 venues, the majority of which are located in one of two Zones in Tokyo proper. A handful of events will take place in neighboring areas like Yokohama, Saitama, Sendai, Ibaraki, and Sapporo. 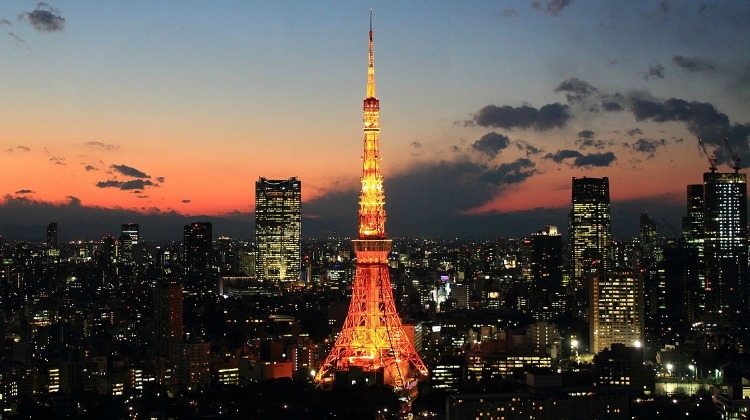 Tokyo Tower, one of the most iconic parts of the city’s skyline, is located in the Heritage Zone, Tokyo’s downtown area. Source. Tokyo Bay and the Rainbow Bridge. This area will host the majority of events during the Summer Games. Source. 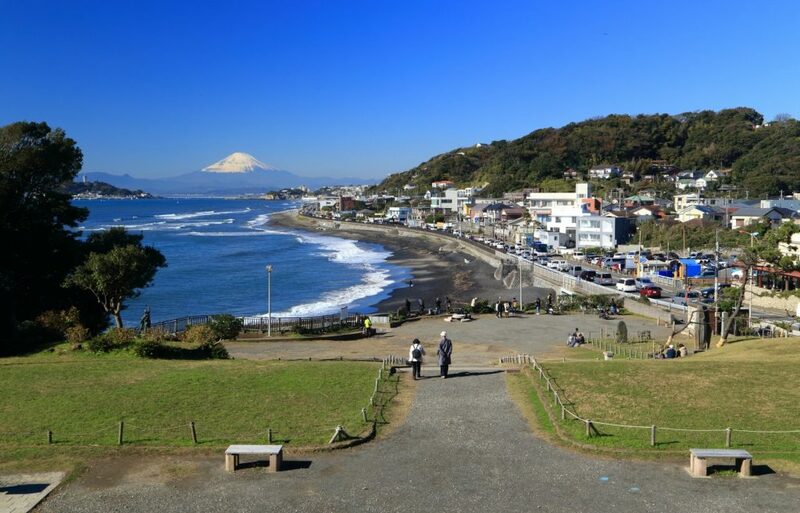 A quick trip outside of Tokyo, the resort town of Enoshima will host the surfing and sailing events for the Summer Games. Mount Fuji is often visible in the distance. Source. 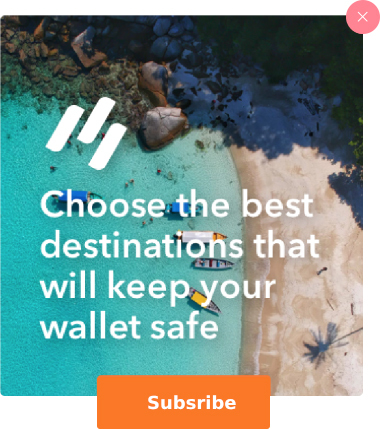 Want to watch the world’s greatest athletes and explore the world’s largest city all in one trip? 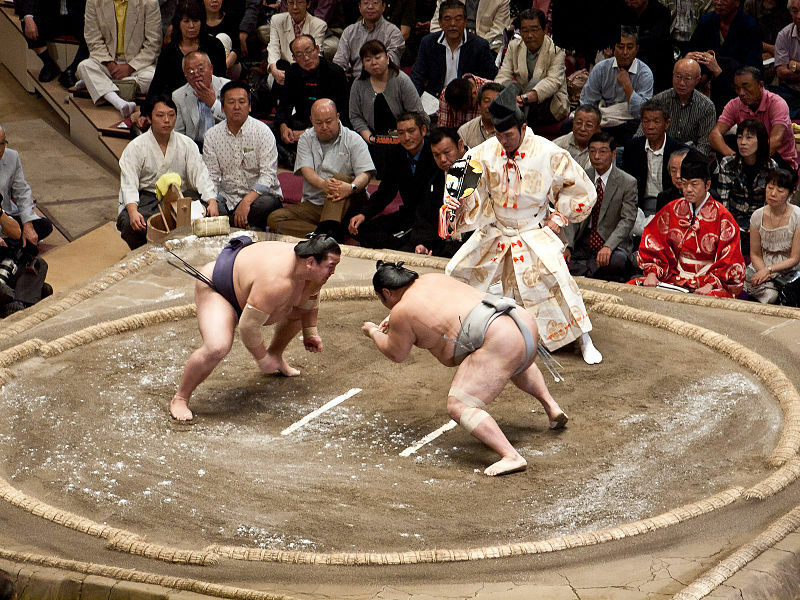 Start planning your Bucket List adventure to Tokyo for the 2020 Summer Games.